The science of metamaterials and photonic crystals has been rapidly advancing in recent years. It ushers the new exciting possibilities for fusion of electronics and optics at the both nanoscale level and THz frequencies. Among the structures actively studied are the wave guiding channels made of nanoparticles supporting backward wave propagation. 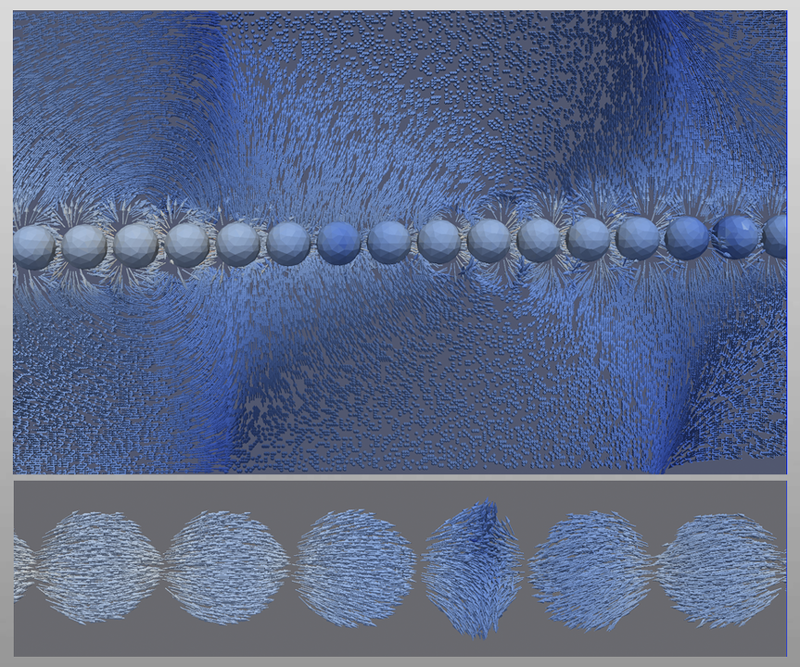 To demonstrate capabilities of Wave3D software to analyze such novel plasmonic structures at THZ frequencies we consider an example of a waveguide made of fourty 10nm radius silver spheres (Fig. 1). The structure was studied in the paper by A. Alu and N. Engheta ‘Effect of small random disorders and imperfections on the performance of arrays of plasmonic nonoparticles’ published in the New Journal of Physics, no. 12, 2010. Fig. 1: Instantaneous distribution of the electric field in longitudinal cross-section of the nanoparticle waveguide at 750THz. The waveguide is made of 40nm silver spheres 10nm radius each. The spheres centers are situated at 22nm away from each other and feature negative relative permittivity of -4.56+i0.22. Fig. 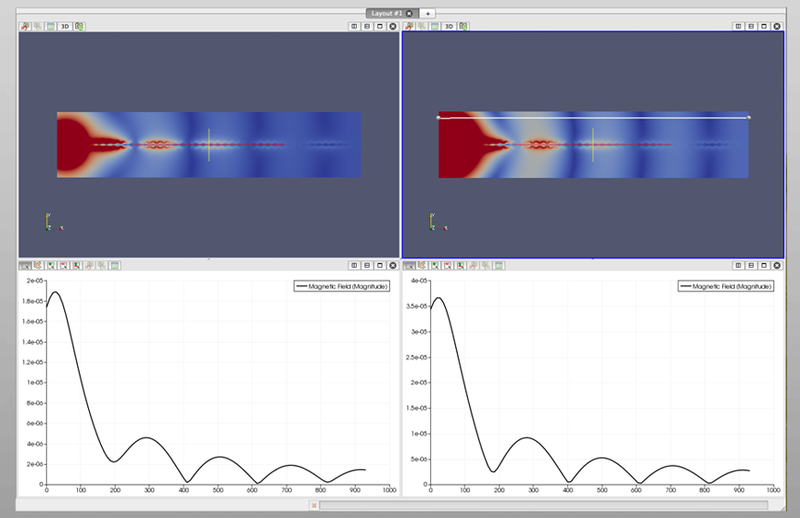 2: Distribution of total (left) and scattered (right) instantaneous magnetic field magnitude along the line situation 80nm above the waveguide axis. Fig. 3: Close up view of the instantaneous electric field near the waveguide (top) and inside the nanoparticles (bottom). The depicted field inside the particles constitutes the solution of the Volume Integral Equation. For validation of the Wave3D solver the solution of scattering on plasmonic sphere featuring permittivity -4.12+i0.12 is compared below against Mie series solution. Fig. 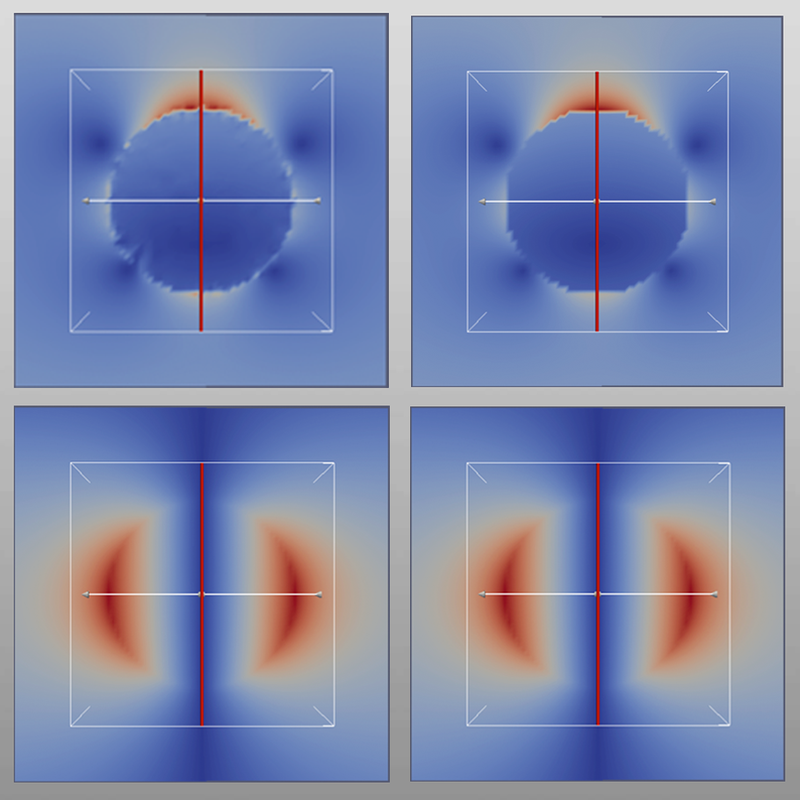 4: Depiction of instantaneous near electric (top) and magnetic (bottom) field magnitude distribution at time t=0 s produced by radial dipole situated 9.5 m away from the surface of 0.5 m radius sphere featuring permittivity -4.12+i0.12. The frequency of analysis is 50 MHz. The Wave3D results (left) are compared against Mie series solution (right). Fig. 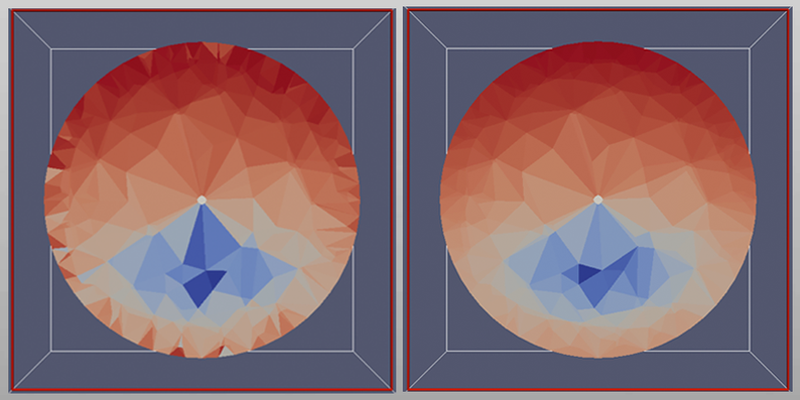 5: Cross-sectional distribution of the electric field magnitude inside the above plasmonic sphere calculated by Wave3D (left) and Mie series (right).